This week I’ve handed my blog spot over to an artist whose medium is being creative with the airways. 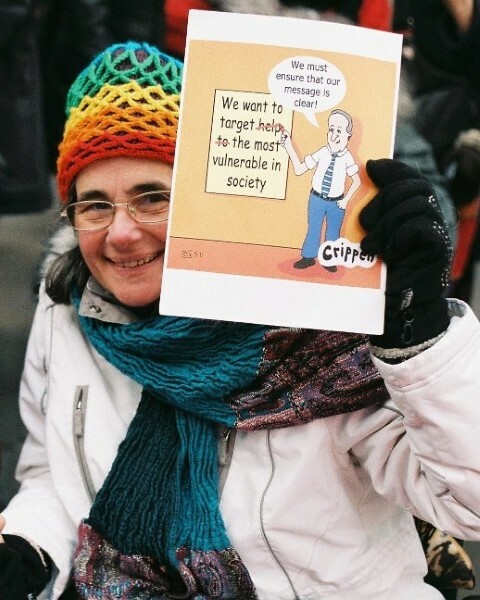 Her name is Merry Cross who, apart from being a presenter on Reading community radio, is also well known as a disabled activist and one of the organisors of the Berkshire Disabled People Against Cuts movement. 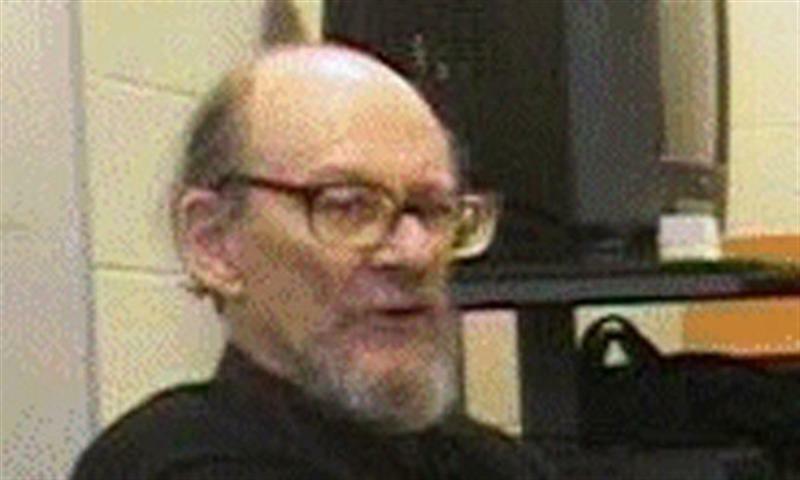 "Years ago, it struck me that radio is an ideal medium for virtually all disabled people, except obviously you Deafies! * I even drew up schedules for an entire radio station devoted to our issues, and tried, naively to float it (it sank without trace). But then the internet and community radio stations came along and I leapt at the chance of a weekly show on Reading’s ‘Make Yourself Heard’ - blissfully unaware of how much work it would be! But I’m so glad I did it, because not only can it publicise local issues and give local Crips a voice, there’s nothing to stop it covering national issues too. And then there’s nothing to stop English speaking people from all over the world contributing or hearing it! Also, not being part of a posh outfit run for profit by a bureaucracy, there is no pressure to support the status quo. FREEDOM! What’s more I’ve found some hugely supportive people through it, and formed many new relationships. So, whilst I’d quite like never to have any competition (!) I’d recommend daring to take the step to anyone. 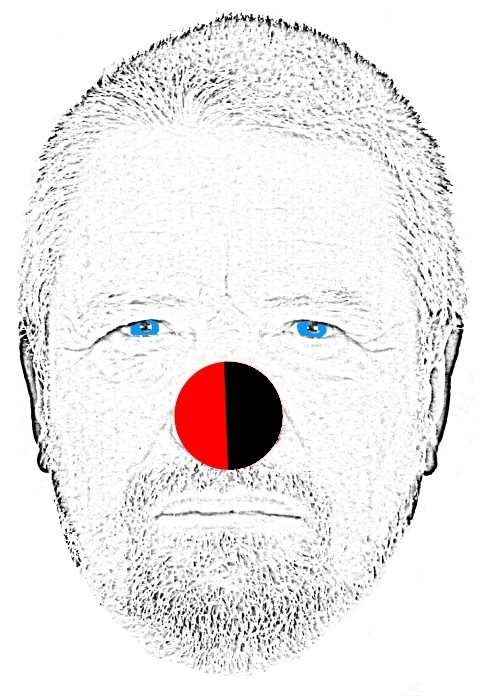 And of course there are some other disabled people doing radio shows, with 'Alan Commonly Known as Maglite' trying out Skype as his prefered medium. So I’ll just have to keep upping my game! *And it’s finally dawned on me that I could at least make the scripts available on request, to make it somewhat accessible to Deafies." You can find out more about Merry and her work with Reading community radio by clicking on this link. Like hundreds of other disabled people in the UK today, Adam Lotun has experienced verbal and physical abuse, has been spat at, pushed off the pavement in his wheelchair into oncoming traffic and accused of single handedly bringing this Country to the brink of bankruptcy by claiming disability benefits. Now on top of this, like thousands of other disabled people in the UK, Adam has been subjected to the ATOS work capability process and as a result has had his benefits cut and his accessible Motability vehicle taken away. 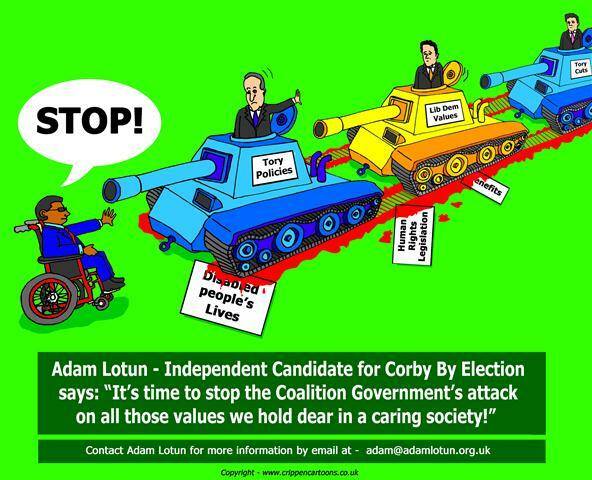 However, unlike most of his disabled peers who have been left feeling disempowered by the heartless actions of the coalition government, Adam Lotun has decided to make a public statement and say "no more". Taking his fight straight into the enemy camp, Adam is standing as a Prospective Parliamentary Candidate for the Corby By-Election on Nov 15th 2012. His aim is to show that the age of the career politician with their selfish, self promoting attitudes has ended and that the caring and compassionate society that he was brought up to believe in still exists. Speaking in his Blog, Adam argues that today's politicians have lost their way and no longer care about those very people that they are supposed to represent. "I'm arguing against injustices by those in power ... it is no longer acceptable that the 1% should be ruling over the 99% ... that Parliament needs to be reformed so that we can secure a future for my children and future generations." 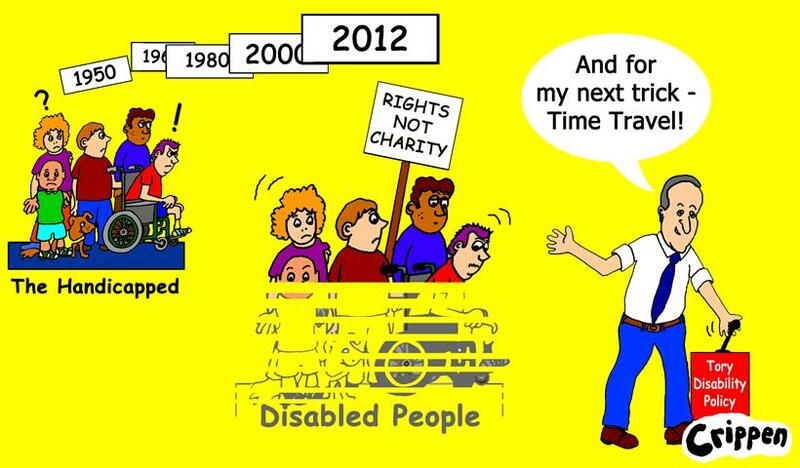 Adam has been working with other disabled people to achieve disabled people's rights and equality for over 20 years. He has played a leading role in recent direct action initiatives, chaining himself to other wheelchair users in attempts to block roads and raise awareness of the damage resulting from cuts to disability benefits. 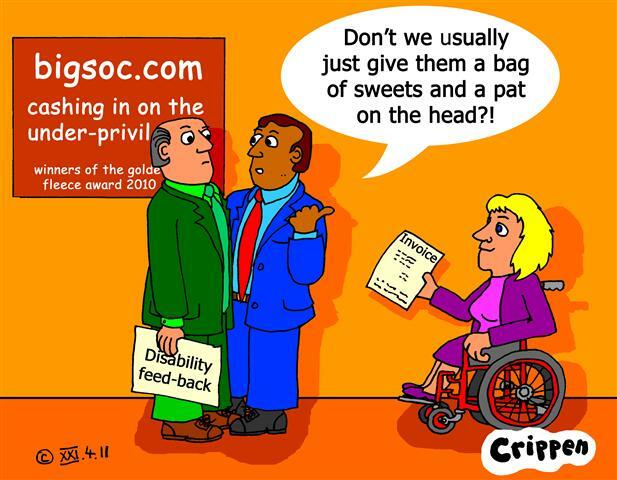 During this time he has heard many examples of discrimination and injustice, but the stories that are emerging from those disabled people who are being abused by the ATOS work capability process are causing him the most concern. In his latest blog Adam comments on a recent CH4 television news item that focussed on one example of just how badly disabled people are being treated by this system. "I have heard of a great many injustices to disabled people and have often taken up the fight with them to redress their wrongs ... but I have never witnessed anything so deliberate as to lead to the tragic and needless death of the disabled person upon who the CH4 news item was based ... it left me feeling sick to my stomach." This particular news item has become a clarion call for Adam and those other disabled people who are working with him towards winning the Corby By-Election. Adam feels confident that the people of Corby will turn out in force to elect him as their parliamentary candidate, influenced by the support that he is receiving from across the country by the disabled community. He added: "I know that the people of Corby believe that all of my supporters from around the UK who have offered their time, support and resources to enable me to represent them, will continue to assist us in our fight for true democracy. "That they now have friends from as far afield as John O'Groats to Lands End who will have their hopes pinned on the people of Corby to make a stand against those outdates ideas that have led this country into the state it is." They will do this by putting Adam forward as their choice to represent their community on the 15th November 2012. If you feel able to spare time to assist Adam in his fight for parliamentary recognition then please contact him by clicking on this link to his blog. Any and all offers of help will be gratefully recieved, not just by him but by the people of Corby. We all have our own take on the Olympics, especially the Paralympics where super crips compete to appear normal and we're all expected to forget about the billions being spent on this event whilst many of us have our benefits pared down to the bone ... or am I being too cynical?! This article caught my eye the other day about a young disabled guy, a wheelchair user, who felt the need to carry the Olympic torch for a few yards. No doubt he was doing this to be ironic (let's give him the benefit of the doubt) but what actually happened to him could only happen to a Crip. He'd only gone a few feet when the torch flickered and then went out! 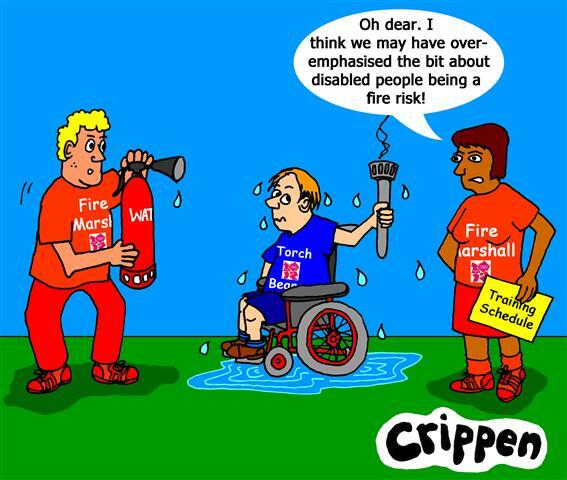 No problem, as the 'real' flame was being carried in a back-up vehicle (don't let's trust the 'real' flame to a disabled person eh?!). Torch re-lit, he trundled on for another few feet before it happened again. Without missing a beat, one of the organisors sprang forward, patted him on the head, then swiftly slotted in the next, non-disabled torch bearing volunteer! Bet our disabled volunteer is having problem's selling his torch on eBay though?! Another job for the boys?! 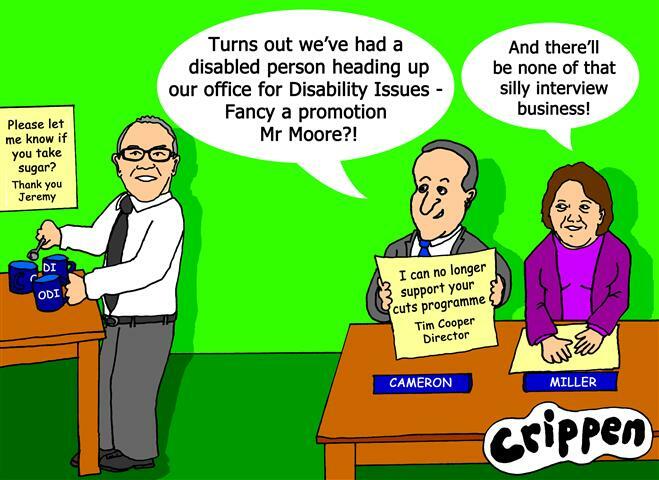 The CONDEM Coalition has replaced the disabled director of its Office for Disability Issues (ODI), Tim Cooper, with a non-disabled civil servant. Rumour has it that the switch, which wasn't even advertised, was due to problems around Cooper being forced to give a public defence of the government’s record after disabled activists criticised its programme of spending cuts and attitude to human rights. Cooper, who has refused to discuss the reasons for his departure, is moving to a new job as chief executive of Advance, a supported housing and employment charity, after two years as ODI’s director. 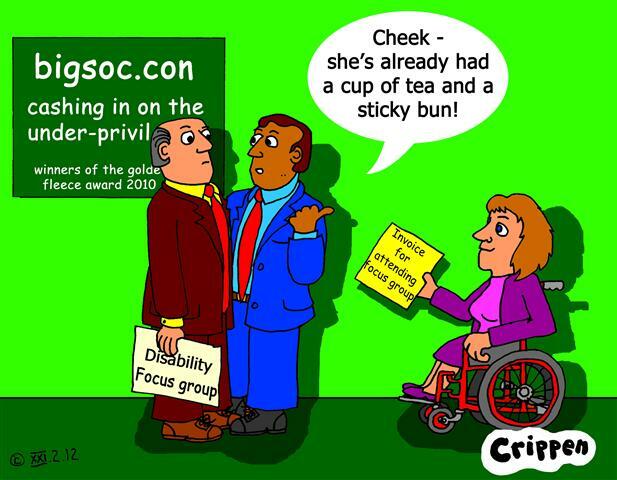 You\'ll recall that the ODI was set up in 2005 by the Labour government to help deliver equality for disabled people by 2025 and act as a champion for disabled people across government. The person replacing him is civil servant Jeremy Moore, who is NOT disabled and will also be taking on the role of director of independent living. He was actually appointed before many ODI staff were told Cooper was leaving. He will now be responsible for all disability issues across the Department for Work and Pensions (DWP), including employment, benefits and the ODI. A DWP spokesman said Moore was appointed because he “has a lot of experience working on disability issues and was the best candidate for the job”. Oh yes?! Apart from having held "various roles in the Department, most recently as director of the departmental transformation programme" (whatever that is?!) I haven't met one Crip who knows anything about him. In fact, apart from his resemblance to the late Eric Morecombe, he appears to be just another Tory clone in a grey suit. He certainly seems to be Maria Miller's (minister for disabled people) blue eyed boy though. Here's what she had to say about his promotion: “Jeremy brings with him a wealth of experience and expertise and I look forward to working with him in engaging with disabled people and disability organisations to ensure they are fully involved in the decisions which affect their lives." And we all know what attention she feels we deserve ... bugger all! I was offered voluntary work but rejected it. I have worked so hard to get where I am and giving away my hard earned knowledge for free goes against everything I believe in as a disabled women with strong working class values. I do believe there is still a mainstream view that we have nothing of value to offer, so I just wanted to voice my own thoughts regarding Cameron's Big Society rhetoric.